The Engineer was delighted to host Lib Dem leader Sir Vince Cable at this year’s Collaborate to Innovate conference at the MTC in Coventry. The former Business Secretary is a champion of engineering, skills and innovation. He has also been one of the most prominent opponents of Brexit, and in particular the economic implications of a hard Brexit. 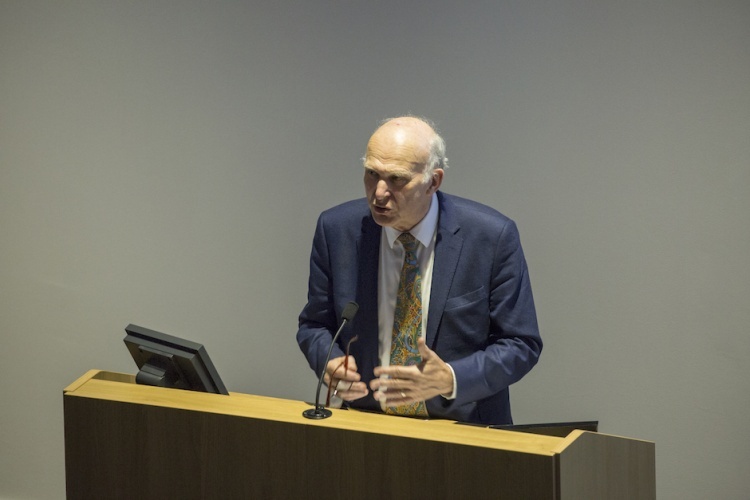 During the course of his keynote address, Sir Vince was critical of Britain’s lack of long-term thinking in relation to investment, education and apprenticeships, but also praised aspects of UK innovation that have blossomed in recent years. Having only won back his parliamentary seat in the June 2017 general election, Sir Vince spoke about how he spent his two years of political exile learning more about German manufacturing, including a stint on the board of a Bavrian Mittelstand automotive supplier. Cable pointed out that engineering plays a part in a huge amount of UK business. Inevitably, Brexit did not take long to surface, but Sir Vince was keen to point out that there are many other challenges facing the UK that do not relate to our relationship with the EU. Cable gave the example of JLR which, due to limitations in the electricity supply at its West Midlands manufacturing base, is unable to expand operations as it wishes. He noted that while issues such as these had nothing to do with Brexit, exiting the EU would bring other problems. Citing the example of Siemens, Sir Vince said the Single Market had enabled the company to reduce the number of specifications it followed from 180,000 to around 10,000. This represented “an enormous simplification”, yet the danger for UK engineering companies was that this “all now goes into reverse”. Exiting the Customs Union, according to Cable, could have more immediate consequences. R&D is also likely to suffer, as the UK is a net beneficiary of research funding. On top of this, exiting the EU will see a major source of VC funding dry up. 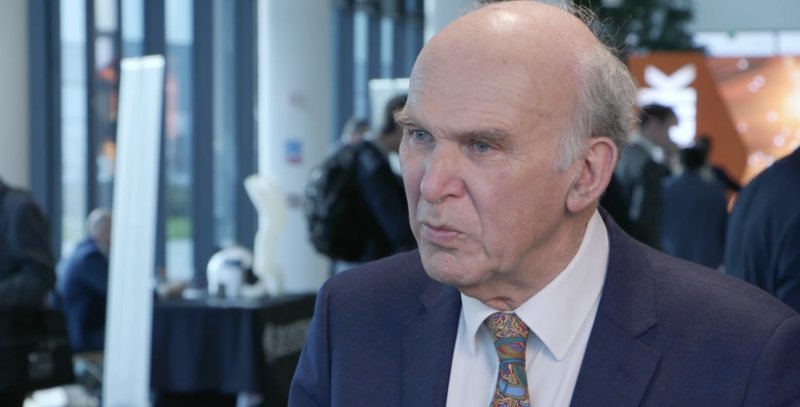 It’s well-documented that Sir Vince and the Lib Dems are in favour of giving the public a vote on the terms of the deal, but he was keen to point out that businesses should also plan for a No Deal scenario. Aside from Brexit, the other key challenge the UK is facing is skills and careers. “The whole supply chain of young people coming through the system is currently blocked, because they’re not getting proper advice,” said Sir Vince, referring to the poor level of careers guidance at schools. Noting the political disaster that still haunts the Lib Dems over tuition fees, he defended the decision of the coalition back in 2010, stating that it was designed to ensure universities were properly funded. Engineering degrees, for example, cost significantly more than £9,000 per year, as do many STEM qualifications. However, Sir Vince also acknowledged the difficulties faced by young people, and that a better solution should be sought. The Lib Dem leader was also critical of the Apprenticeship Levy, claiming it was undoing much of the good work achieved in recent years. With regards to UK innovation, Sir Vince was more positive. The growth of the Catapult system and Innovate UK should be lauded, but more needs to be done to retain the innovation and intellectual property that originates here. Perhaps surprisingly, Cable also stated that he believed the UK’s takeover regime is far too permissive. He cited the example of ARM’s sale to Softbank, and the atrophy that the British operation is likely to suffer over time. Our thanks once again to Sir Vince Cable, and indeed to all of our speakers and attendees at this year’s C2I conference. Over the coming weeks we’ll be publishing a series of features on the winning collaborations and shortlisted entries, so keep an eye out for those. Weird that the EU are proposing a variety of ways of managing FDI and takeovers of strategic European technology assets including a common European framework for assessing strategic implications of takeovers, and yet Sir Vince says we couldn’t manage to have such a thing within the EU. Almost as if he’s being seriously disingenuous about BrExit. WHERE is there any concrete indication – or better, guarantee – that funding, for example ULTRA-insulation approvals will be anything better than “Leviathan” as admitted by officials both sides. rather than research approve proven schemes so success can breed success? and an end to these ridiculous competitions. cannot either side see good stuff, make the money available and let us get on with it? I was fortunate enough to attend the conference and, while I enjoyed Sir Vince’s talk, I was saddened at his negativity regarding Brexit: following the party-line more than clarifying issues. The conference was absolutely brilliant and the visit to the MTC was eye-opening: these show what is being achieved in British industry and give good grounds for future optimism. Congratulations to The Engineer on the fine conference. If JLR are short of electricity now, how can the promise of all electric vehicles by 2040 be achieved without some joined up thinking about new power stations and distribution infrastructure. Please don’t say renewables as it is on the cold winter days when the wind is light and the sun only shines hazily for a few hours that we need most energy production. Sir Vince Cable the economist. I respectfully think that this fact says everything about him and the professional that he comes from. In this respect at times I just cannot understand the intelligence of some people and where I see the opposition politicians like Cable and some of the Tory’s own people being amazed that there has been no assessment of the economic situation post BREXIT. It amazes me in this respect as apparently no-one looks or even considers the economic predicting that economists have undertaken even in recent times and where over 99% got it totally wrong about the financial crash in 2008 (the biggest global economic effect ever in monetary terms to the wellbeing of 90%+ of the people worldwide). I say totally wrong, as they did not even predict that a global financial collapse was imminent or in fact gave any warnings in the years preceding the actual meltdown. Indeed it has to be said even after 2004 (a clear 4 years before the largest collapse of the financial markets in known history and greater than that of the 1930s in creating debt) when Greenspan warned Bush, Blair, Brown and western leaders that the financial markets had to be reeled in or a global meltdown would likely happen, the economists and politicians took no notice. For at the base level and through time immemorial, economists are good at analysing the past, but they certainly have not a clue if truth be told, in predicting the future. Indeed, in this respect, history has recorded this over the centuries with these so-called ‘bubbles’, not mere years. Therefore people asking for predictions of how things will be economically in the future after BREXIT are just like asking for pie-in-the-sky’ in reality and would have no merit at all. But I think I know why people ask for this unknown vision of the future though, as they require certainty and to know how they will be financially. Unfortunately if they used their intelligence just a little bit and common-sense, they would realise that economists have not the means to predict the future and where they certainly do not have a crystal ball many seem to think that they have. Indeed even if different scenarios were provided, this would not mean a thing also, as all of them would be still unknowns and that’s the basic truth. I would call it a fool’s errand. Cable has not the background or knowledge to know the ‘real’ value of engineers and being an economist knows little of the great work that engineers do. He basically has no understanding of the inherent qualities of this great profession and would never have been an engineer due to his economist crystal ball thinking on predictions and like them all it has to be said. Having known and know some of the greatest engineers of the 20th and 21st century I can state this from direct knowledge of these people. I agree that economics is a hind-sight profession, and when they start to apply it to the future they have caused more damage than non-economists. However Sir Vince is much more than an economist having been a minister in government and I personally hold him in great esteem. Having said that, I disagreed with all of his Brexit views and, being a critic of Israeli aggression, I am not eligible for the Liberal party anyway. His views on industrial development and collaboration were enlightening and clear.